To configure the Start Menu, you need to use the Customize Start Menu dialog box. Use the following steps to open the Customize Start Menu dialog box. 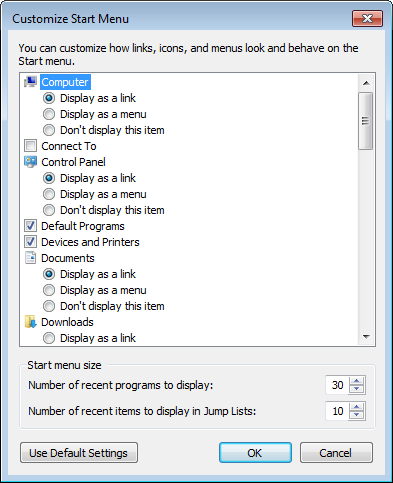 1 – Right Click on the Start Menu. 2 – Click on Properties from the submenu. 3 – Click on the Customize button. The main list box allows you to control the way the links are displayed and how they behave in the Start Menu. You can also choose which system links you do and do not wish to display. These two counters control the number of recently opened programs to display in the Start Menu as well as the number of recent items to display in the Jump to Lists. It makes sense to turn the Control Panel link into a menu because opening the Control Panel in a seperate windows is a waste of time. You only ever want to access a single item from the Control Panel at any one a time.